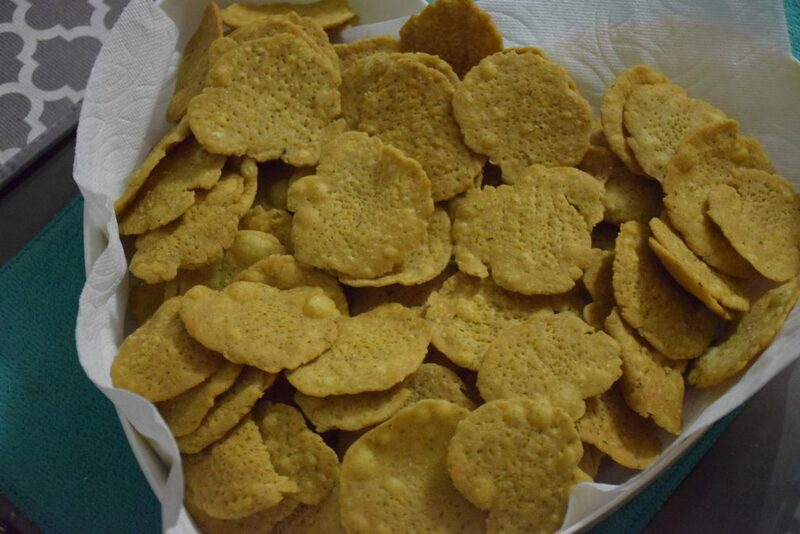 Indian homes are bustling with the aromas of “Sweets” and “Farsaan”(savory snacks) again !! With the festivals , there comes a sweet air of freshness, happiness and yummy delicacies. But why to ignore our health while enjoying these moments ? 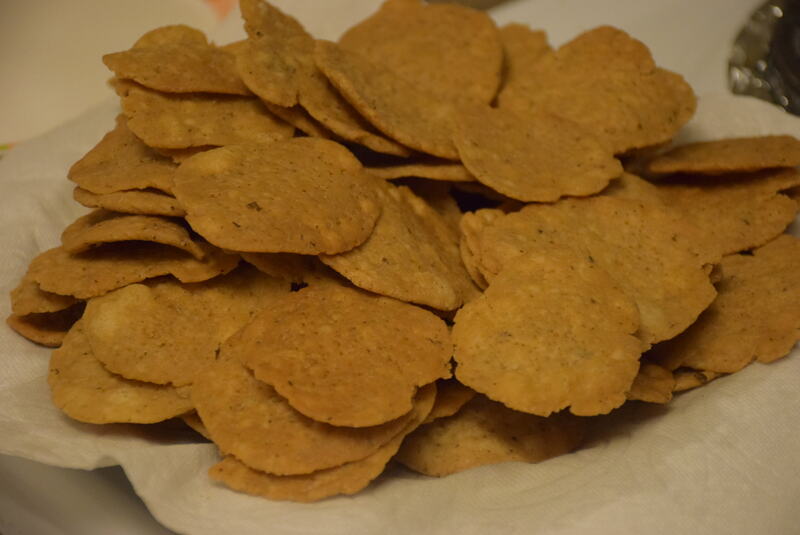 So, This is my version of healthy Mathri or Matthi (a savory snack). Just add the ingredients listed below with some love and passion and in no time you will get this munching healthy snack ready for you and your family. 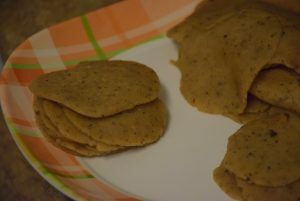 You may use just whole wheat (atta) to prepare them . 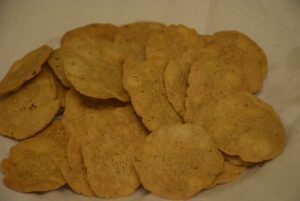 But I usually mix half atta (whole wheat) and half maida(refined flour) to retain the taste and balance the health quotient. These not only go well with your tea but also serve as a good appetizer with some dry curry (sookhi sabzi) or home-made mint dip(hari chutney) or a mango pickle(aam ki chutney ya achar). So lets jump to the recipe now..
2. Wok and slotted spoon ,a plate lined with paper towel. 1. Sieve the atta and maida in a paraat(tureen) side by side. 2. Make a well in the center. Add refined oil in the well. 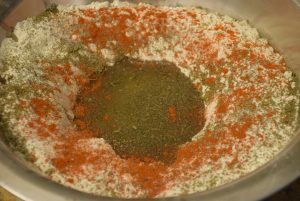 Sprinkle the salt and red chilly powder on the flour. Crush some carom seeds between your palms and add in the flour. 3. Now microwave the kasoori methi for 10 sec. Crush it between palms and sprinkle in the flour. 4. 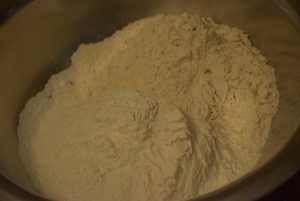 Start mixing the flour such that you see it binds in small portions like this. 5. 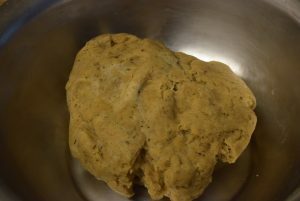 Take some water and start adding it little by little to knead a stiff but pliable dough. It would look like this. 6. Keep it covered with a damp cloth for around 20 mins. This will set the dough. 1. 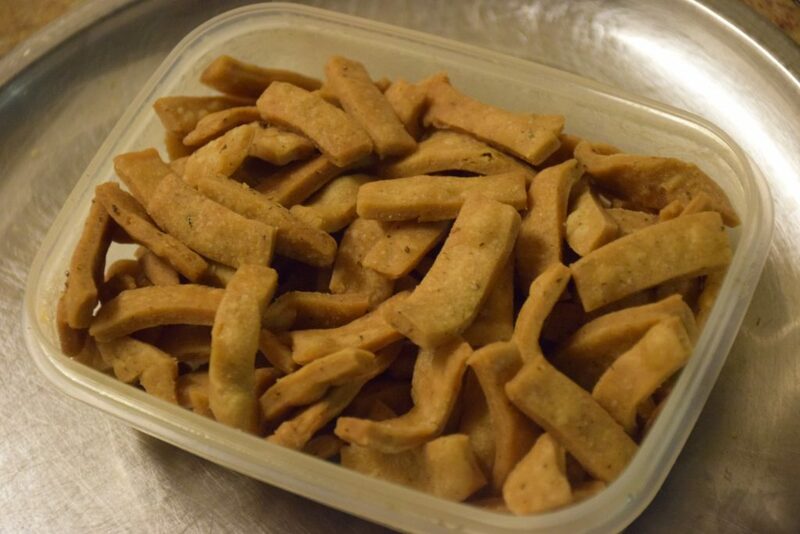 Uncover the dough and cut small portions from the dough to make small size pedhas(loi). 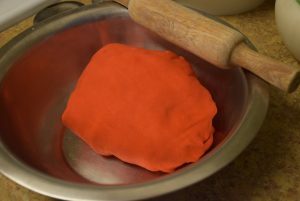 Make these small discs and cover them with the cloth so that they don’t dry out while you are rolling the rest of the dough. 2. 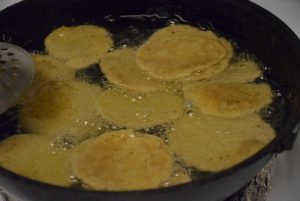 Start rolling the small discs into a small size roti of about 1/2 cm thickness. I like them thin crust ,hence. Roll according to your preference. 3. Now heat the oil in a wok to medium temperature. The oil shouldn’t be too hot or too cold. 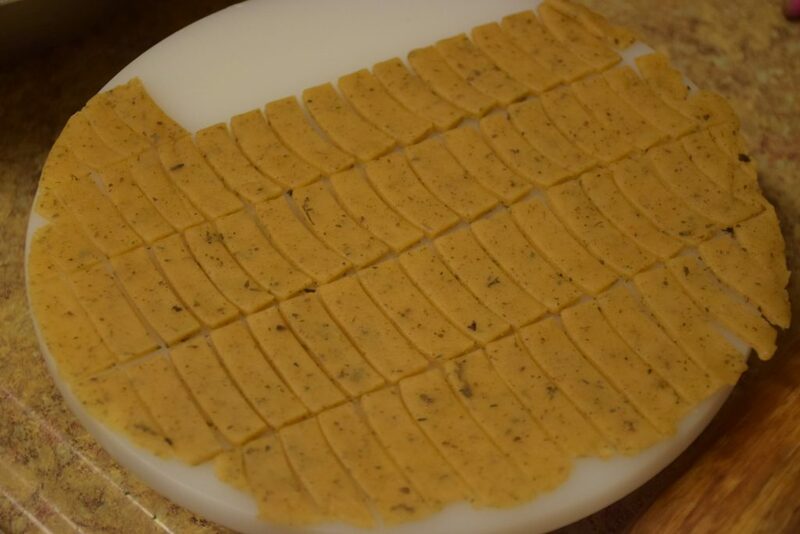 After rolling around 15 to 20 mathris ,heat the oil; so that you have enough time to roll and make the rest of the mathris while the oil is heating. 4. 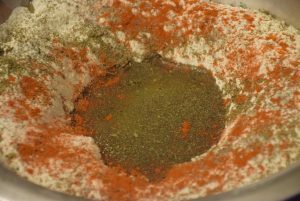 After rolling the mathris to the desired shape and size, poke them with a fork or knife all over to make small holes or dents . This will prevent them from rising in the oil , and they will turn out flat, just the way we want them. 5. Once the oil is ready , add 15 to 16 mathris at a time in the oil. 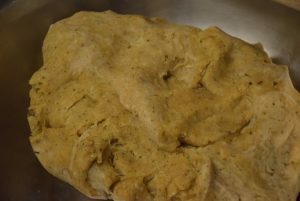 TO check the oil, drop a bit-piece of dough. If it sizzles, then slowly comes up to the surface it is ready. 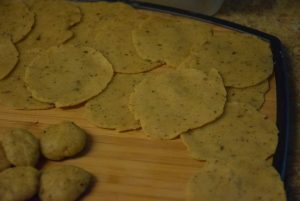 Also lower the heat once you have added the mathris , so that they turn out crisp and crunchy. 6. 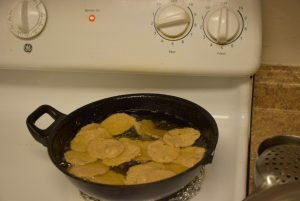 Once they are added in the oil, don’t touch them often and let them fry and come up on their own. 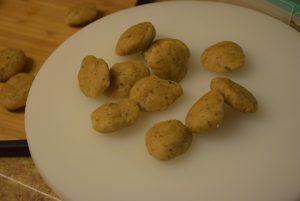 After about 5 mins you may turn them so that they get cooked evenly from the other side as well. 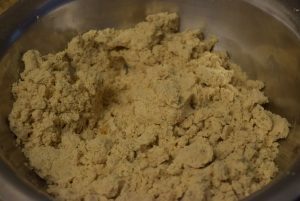 One batch of mathris usually takes about 8 to 10 mins to be done from both sides. 7. 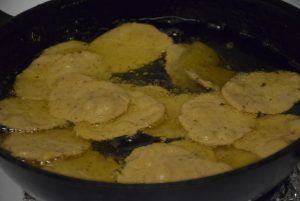 Once you see the change in color of the crust and smell like they are fried, take them out on paper-towel lined plate by dripping out the excess oil in the wok. 8. 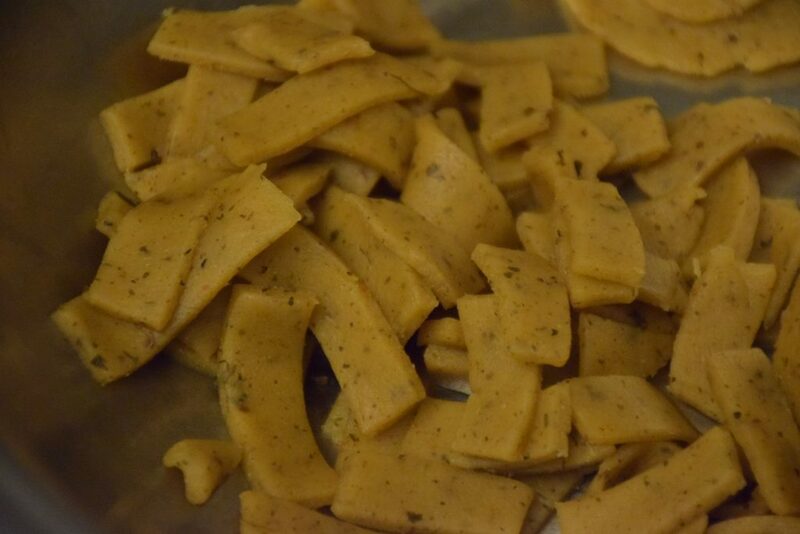 Similarly fry all the rolled mathris and let them cool in air. 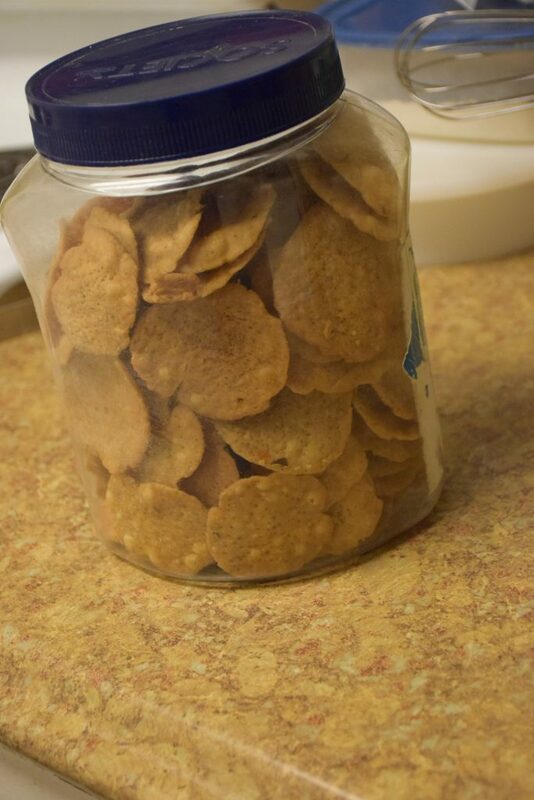 Once they are cool to touch, store them in air-tight containers and munch on after workouts or swimming or with tea. Moreover, this same dough is used for making Namak Pare too. 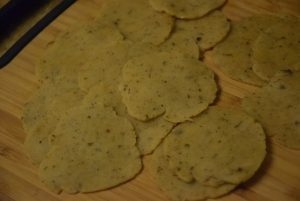 So if you feel exhausted after rolling out these mathris, just roll the whole portion of left out dough and make these crunchy Namak pare. I hope you would try and share the experience with me ! Till then keep cooking and enjoying life ….. This entry was posted in Appetizers, Diwali Delicacies, Kids- Favourite, Recipes, Snacks and tagged atta-maida mix, Carenshare, daughter's favorite, Diwali special, Festival's time, forked, Fried, helper, Indian, kasoori methi, kids favourite, Mathri, Matthi, munching between, oil, rolled, savory snack, shweta jindal, thin, thin crust, whole wheat mathri, with achar, with chutney, with tea, zindagisikhati.